Floral wall decoration have been known for a long time, many people like it and use it in their own houses. Another, equally interesting alternative for floral themes, are patterns with tropical leaves. This is an ideal solution for people who appreciate extravagance and want a bit of freshness in the arrangement of their own house. 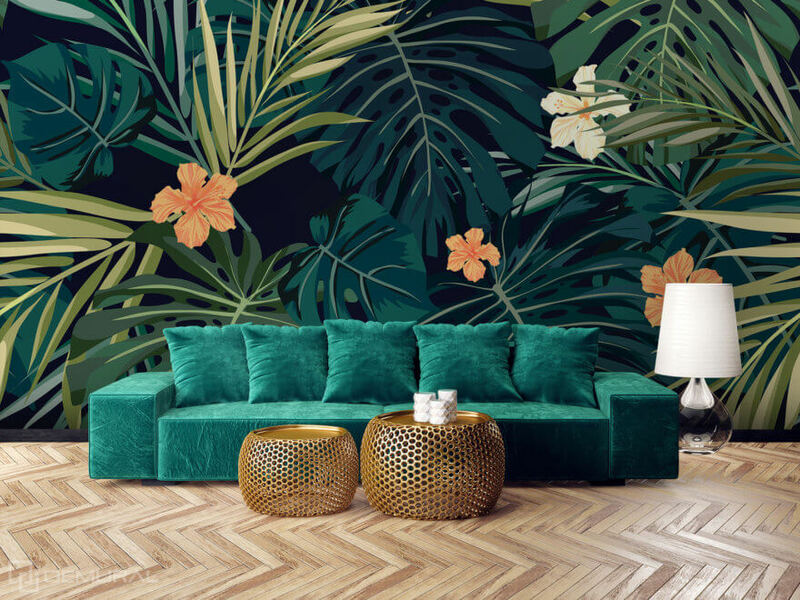 A theme of tropical leaves has quite intensive colours – it uses light and dark tones of green and yellow. That is why while choosing colours for the whole interior arrangement with the botanical patterns we should maintain right proportion. 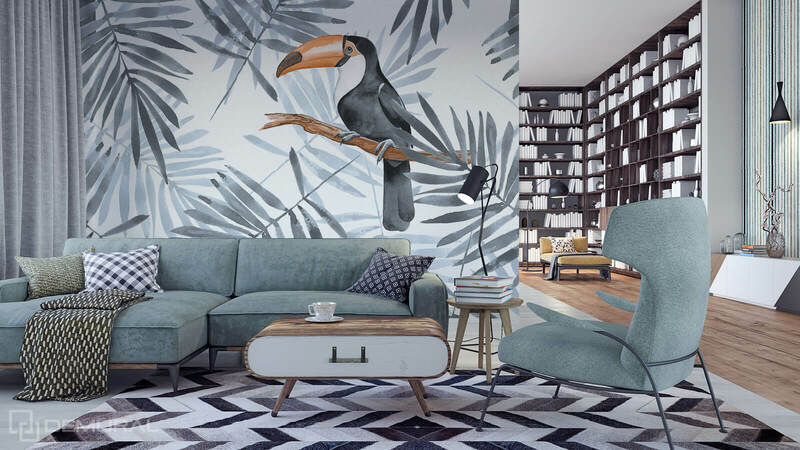 Quite fashionable combination is white and grey on the wall and furniture, golden decorative additions: candles, trays and other ornaments with wall decoration of tropical leaves and live, thick pot plants. Such combinations are more and more popular because they are an interesting and really nice alternative for the Scandinavian minimalism. Green composes perfectly with grey, brown, yellow, gold or silver – those colours should be used as a complement of the leaved decoration. An interesting combination is a mixture of green themes with a brick – it looks very modern and industrial thanks to the brick and the leaves enliven the room. Surely those arrangement will be loved by people who appreciate the industrial, loft character of the interiors, but they want to make it warmer. What form should the decoration with the theme of tropical leaves have? • Here we have the whole range of different decorations. 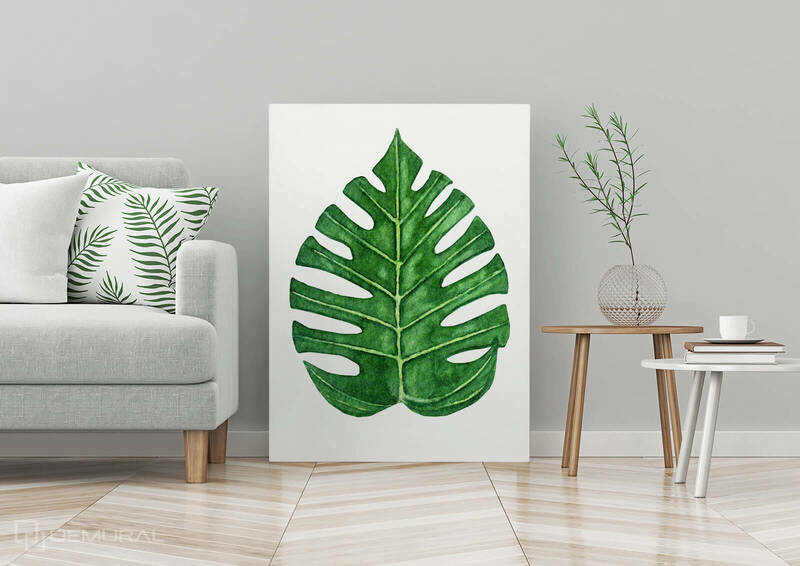 First are the canvas prints representing leaves. It can be a singular element of a plant with a white background or composition representing flowers and leaves. • Another decoration that will look perfectly in the interior are different kinds of textures. 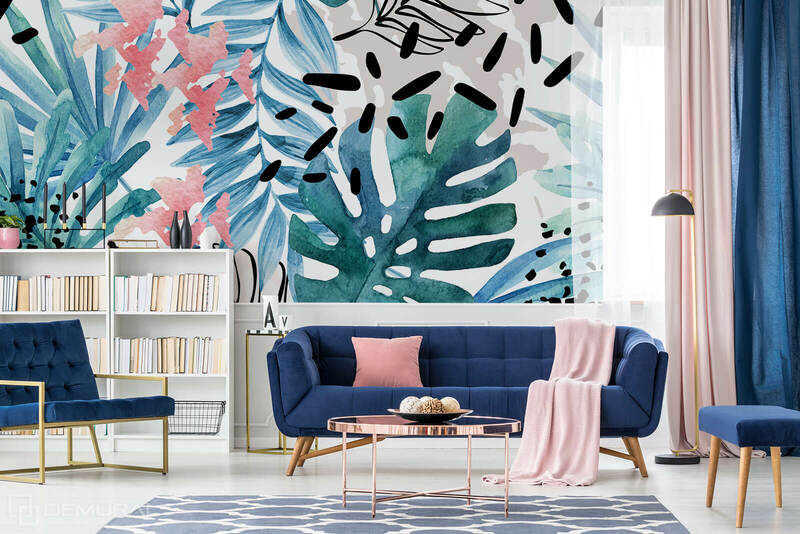 Without any problem we can decorate our flat or house with cushions with a theme of tropical leaves or with string or corked decorations that together create a pleasant yet coherent wholeness. • Also the curtains with such pattern will look nicely. When we decide on using fabrics with botanical theme, we must remember about choosing the toned colours for the rest of the decorations. It would be better if those elements did not have any patterns. Otherwise we risk having a stylish chaos and visual overload that will not present the green, intensive plantal themes inside the room. 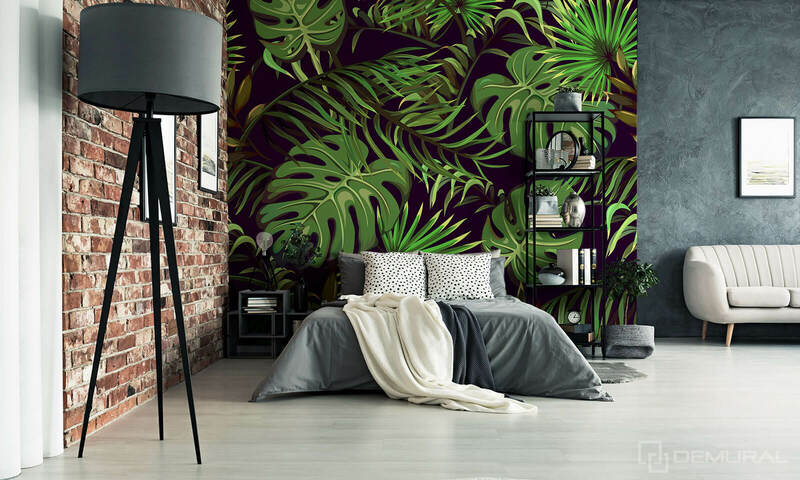 • If we want a real change in our room, we can decide on covering one of the walls with a photo wallpaper with tropical leaves. It will be perfect! Such an arrangement could be complemented by white walls, light furniture or wooden additions. Where should we use decorations with tropical leaves? Botanical themes are perfect for almost of types of rooms. They will look nicely in a living room where they would create an interesting and cosy space. 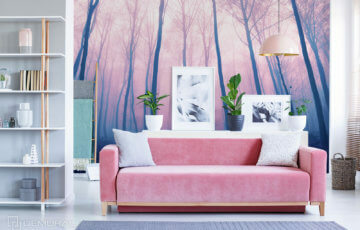 Also in the bedroom where they will constitute an interesting addition, or the child’s room as an alternative for traditional blue-pink decoration. Each of us should without any problem find decorations with botanical themes that will meet our needs. However we should remember not to exaggerate with the fabric and patterns. 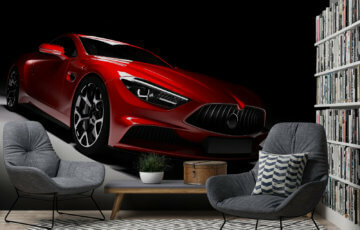 It is better to be minimalistic because then the effect will be more spectacular and the room will be a place where everyone will be glad to spend some time feeling comfortable inside.